On the west side of Mesilla’s storied Plaza, between two unassuming storefronts, is an unremarkable door. But behind this door is a staggeringly rich trove of over 4,000 treasures: a unique collection of art, furnishings, textiles, and ephemera spanning four centuries. In toto, they tell the story of New Mexico and its borderlands. 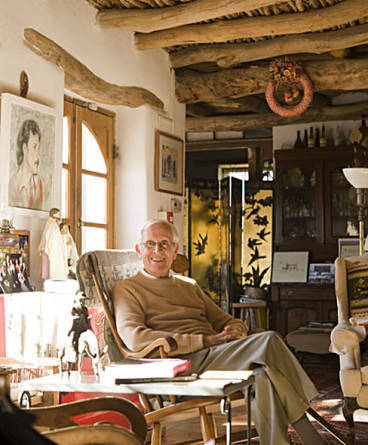 And they tell the story of the collector, J. Paul Taylor, one of Mesilla’s—and the state’s—most notable living treasures. To this day, bold and curious souls who knock on this door often find that Taylor himself opens it with a smile, and offers to show them around. It’s just something J. Paul Taylor has always done. For the people of Mesilla, the connection between the revered former teacher, legislator, and cultural ambassador and his house is intrinsic. Ten years ago, all of New Mexico stood to benefit when Taylor and his family decided to donate the house and its unique collections to the state. Now 92, Taylor settles easily into a damask-covered chair in the gran sala. Its tables are laden with a lifetime of memories in stone, wood, and paper—a perfect stage on which to talk about his life and the house that holds it. Mesilla is where Taylor and his wife of 63 years, Mary (who died in 2007), wanted to live from the very beginning. They each had history here. He attended what’s now New Mexico State University, and Mary had visited occasionally, and they both thought it was the right kind of place for raising their family. “Tourists described it as quaint, but we saw a quiet and vibrant Hispanic community filled with wonderful people,” Taylor says, explaining the beginning of a relationship with the village that has grown stronger over the past 66 years. Following university, and a time in the Navy during World War II, Taylor married his childhood sweetheart, Mary Daniels, in 1945. She and Taylor slowly modified the house to accommodate their growing family. By 1958, they had seven children; four still live in Mesilla today. Mary encouraged the first tours of the house. With kids at home and kids at work, Taylor’s reputation as a teacher and storyteller grew. Almost from the beginning, he says, he “wanted to teach New Mexican history differently. I wanted my students to see and touch their history. To understand the connection between their lives now and their past.” The house presented an ideal opportunity. But it’s not just students who flock to the house and what it has to offer to increase understanding of southern New Mexico and the borderlands. For many years, incoming presidents of New Mexico State University and members of the New Mexico Museum Board of Regents would come to the Taylors’ house to spend time talking and get a crash course in regional lore. Then there are the folks who just stop by to see what’s behind the walls—the purely curious, of whom there are many. Taylor is amenable. His habit of taking folks on impromptu tours, his sort of reflexive hospitality, is multigenerational. Taylor and his family’s lifelong affinity for the borderlands region is evident in each of the house’s 13 rooms, and in the bones and body of the structure itself. Built, rebuilt, remodeled, and renovated over 130 years, the house tells the story of different cultures and times coming into contact and becoming something new: It’s a microcosm of the American experiment, but its easy movement from inside to out, its thick adobe walls—and, of course, the artwork—give it a distinctly Southwestern feel. This not lost on Taylor; he’s worked hard to refine and burnish it. “The house is as much about my family as it is Mary’s, as it is about the Barelas of the 1880s, and the Reynoldses of the first decade of 1900s.” And indeed, Taylor and his wife insisted that the monument name encompass those family names as well as their own: the Taylor-Barela-Reynolds-Mesilla State Monument. The many bookshelves throughout the house contain late 17th-century Spanish works as well as more contemporary titles. Textiles, both newly collected from Central and South America, as well as quilts—some of appliqué silk—made by his mother, and Hopi and Navajo blankets can be found on beds and stacked on chests. Paintings and sketches by artists such as José Cisneros and family friend Ken Barrick line the walls. Notable too are the fruits of Mary’s many years as a photographer. Furniture spanning at least four identifiable periods and styles (French salon, Victorian, Neoclassical, and early Hispanic) is scattered throughout the house. Taylor is also an avid collector of folk art. “The things I love are humble things, made by humble people,” he says. Indeed, while there are elements of what might be considered high culture throughout the house, it’s things like a favored rough-hewn chair in the gran sala, pots from New Mexico pueblos, and a brightly painted bullfighting diorama—products of people simply living their lives, expressing their faith, and embracing beauty—that most resonate. But for all of this, Taylor’s house is more than a classroom or a museum. It was, first and foremost, his family’s home. And to mold it to their needs, they added to the original structures while keeping an eye on the history and overall character of the house. “The current house was originally two storefronts with residential quarters behind, and once we’d bought both of them, we had some practical problems,” Taylor says. “We’d have to go outside to get from one side of the house to another. So we enclosed a section of the patio between the two, and created the gran sala.” The other notable addition was one that has taken on greater significance as the cycles of life have made themselves felt in the family, first with the death of Taylor’s son John, in 2004, and then, three years later, that of Mary. At the same time they built the gran sala, the Taylors built an oratorio (a chapel, a traditional component in many Hispanic homes). It now holds images of the Virgin Mary, the chalice used during John’s wedding and funeral, the rosary used at Mary’s funeral, and the ashes of both loved ones. Taylor sees the house and his gift of it to the state as a chance to preserve a way of life. “There is nothing else like this. I hope people 50 years from now can come here and get an idea of the passage of time, and how people lived, and understand that the things in the house reflect what they found important.” Others agree. A few years ago, a group of local citizens got together and formed the Friends of the Taylor Family Monument. Today they help Taylor and his family prepare the house for its eventual transition to state management, run special tours, and raise funds. Back in the gran sala, after two days of conversation, Taylor answers a question about what has changed in Mesilla—the little village he and Mary moved to with such joy and hope nearly 60 years ago. “What strikes me most,” he says, a little bemused, “is just how busy everything is now.” The light from a photographer’s flash momentarily illuminates the room in front of him; a grandchild comes in from the back patio, hugs him; a member of the Friends group pauses to ask a question. Taylor’s desire to be “puttering around in the patio and doing some writing” has been subsumed—gladly, it appears—once again by the pleasant industry of his house and what it will become. Peter BG Shoemaker is a New Mexico writer and journalist. Chris Corrie is a Santa Fe-based photographer. See more of his work at santafestockphotos.com.